Ruth Faas creates caskets from green materials that help limit the environmental impact. As Arlington resident and suburban mom Ruth Faas leads a plumber down the stairs off her kitchen, she warns him he might find her basement a bit unusual, and maybe even disturbing. That’s because it contains the inventory for her business neatly stacked against a wall: coffins. How did a nice mom like Faas end up with a basement like this? It’s in her blood. Her uncle ran a funeral home in western New York, a few hours away from where she grew up in Albany. For three summers she baby-sat her young nephews in their living quarters above the home. Three years later, she founded Mourning Dove Studio. At first Faas, formerly an occupational therapist, was focused on helping people use art to help people honor and grieve those who have died. As she did more research, though, she learned about the environmental impact of the funeral industry. Faas was also shocked to learn that embalmers, who often have consistent exposure to formaldehyde, are believed to be at higher risk for ALS and other ailments. “We started getting away from natural burials during the Civil War,” Faas says, when bodies of Northern soldiers who were killed in the South were brought home by train. The bodies needed to be embalmed so they wouldn’t decompose, releasing gases that could, Faas says, literally cause trains to explode. Then, at the end of the war, Abe Lincoln’s embalmed body was taken by train to retrace all the stops of his inaugural route. Embalming became a status symbol. After expanding her company mission to encompass both art and natural burial, Faas started selling shrouds as well as coffins made of woven fiber, pine, bamboo, and banana leaves (fairly traded and environmentally sound, although she would rather not have been importing products from so far away), and recycled paper. Once she sells out of her current inventory, though, she won’t replace it, instead focusing on the newest phase of her evolving venture. “I wouldn’t have imagined [a cardboard coffin],” says Faas, “but I grew to see the value.” They are not just ready to be personalized, they’re also biodegradable and affordable. Now, Motley and Faas are manufacturing cardboard coffins at a LEEDS-certified factory in Attleboro. 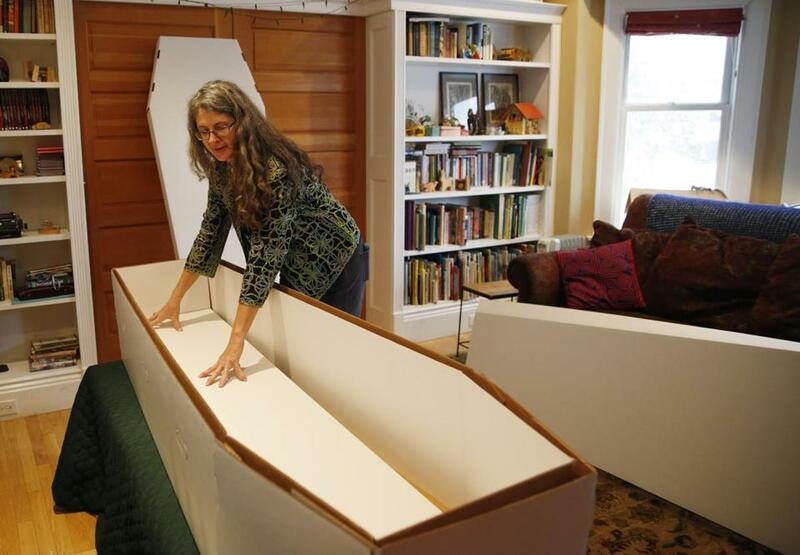 The coffins will be sold wholesale to funeral directors, home funeral guides, cemeteries, religious and cohousing communities, and anyone else who facilitates funerals. Faas says they will retail in the hundreds of dollars, cheaper than what’s usually charged for more standard metal coffins. “I really want to make these options available everywhere,” says Faas. Faas grew up working class and remembers that when her beloved dad died, “the cheap, ugly casket felt — ” She doesn’t finish the thought. So she well understands the complex issues that can accompany death but, she says, “We have to disentangle respect and love from money and things that are toxic” like the adhesives, plastics, and waste of metal most of us have come to think of as standard funeral fare. Many people buy metal coffins, she says, because “we just didn’t know” about the impact.